ModulesGarden EURid Registrar For WHMCS has been built to let you introduce provisioning automation and remote management of .eu TLDs into your WHMCS. Our product provides a complete solution allowing you to connect with your sandbox. Once you make sure that everything works as intended in the test mode, you will be free to perform all most typical actions, including domain registration, transfer and renewal, without leaving your admin area. To help you even further, the module will synchronize each domain's expiration date and transfer details, as well as instantly remove your clients' expired domains after the specified time has passed. Should the need arise, you may also manually request domain deletion, regardless of its current status. Meanwhile, your customers will be allowed to choose if domains should be renewed automatically, change nameservers, as well as edit contact information. It's about time you got yourself the tool that all .eu accredited registrars talk about. Order EURid Registrar For WHMCS and open wider perspectives for your domain reselling business! We apreciate very much the MultiBrand module from this company and we intend to use it for many functionalities. 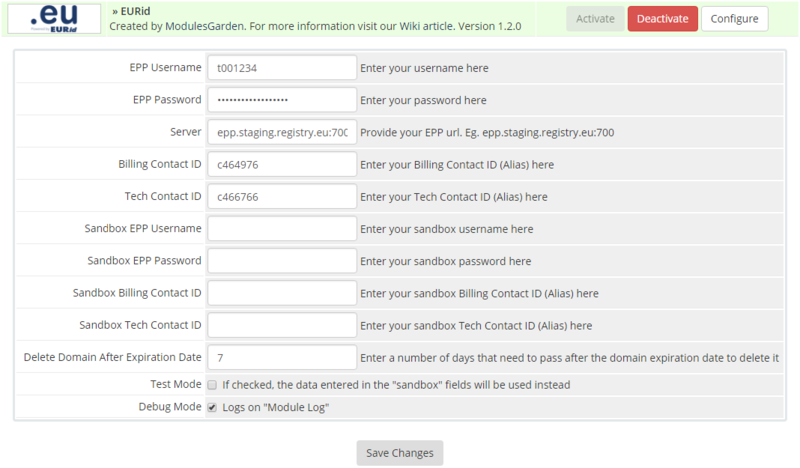 We need more than one site and the module offers the easier way to manage all the sites in a single interface own banding. We use the Eurid module too and the impresion is good too.